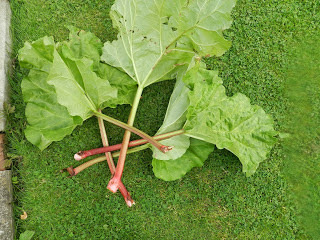 When rhubarb it at its finest, the sun is usually shining then garden and culinary skills can be put to excellent use. I remember, as a child, being given a rhubarb stalk and a small bag containing sugar – the original sherbet dip! Boy did it make your eyes water and jaws tingle. c1390 Pistel of Swete Susan (Vernon) 112 (MED), Columbyne and Charuwe clottes þei creue, With Ruwe and Rubarbe, Ragget ariht. ?1760 H. Glasse, Confectioner: To make rhubarb tarts. Take stalks of English rhubarb..peel and cut it the size of goosberries; sweeten it, and make them as you do goosberry tarts. If you grow your own or are fortunate to know someone who does, always remember to cut the leaves off and discard them as they contain oxalic acid, which is poisonous. Be warned - if you eat too much (stalks, that is) you may think you have been poisoned as its reputation as a culinary laxative is well known! How wonderful that this modest plant is often spoken about on the stage - when lines are forgotten or a hubble of mutterings is called for, then the stock phrase is, of course: rhubarb, rhubarb, rhubarb.